Sometimes, to reach the most attractive destinations, you have to head for open waters, and our Sea Cruise holidays do just that. "Wonderful trip. Included all the places we really wanted to see. The Magellan was lovely." Magellan joined the CMV fleet in 2015 to much acclaim and operates as an adult-friendly ship, no children under 16 years are permitted on board. Able to carry 1,250 guests, Magellan offers a more traditional and leisurely ‘country house’ style of cruising and maritime experience. Enjoy traditional wood type decking and expansive deck areas on a smaller ship able to access more ports of call than the larger resort ships, enabling some really innovative itineraries. All cabins offer two lower beds (some convert to double), bathroom with shower, T.V., telephone, hairdryer, music console, safe, air conditioning and complimentary pool towel. In addition, a cabin designated ‘ocean view’ offers natural light from a porthole or window. There is an electric socket in the cabin of 220v – we recommend you bring a European 2-pin adapter. Lounge/Bar: The magnificent tiered Magellan Main Show Lounge spans the height of two decks and is complemented by a host of superb lounge bars, a pub, library, card and bridge room and casino. Restaurant: Magellan has two beautifully appointed dining rooms; the Waldorf and Kensington restaurants, and the more informal Raffles Bistro for casual dining. Generally there are two ‘formal’ or gala nights planned on each cruise when gentlemen can wear a dinner jacket and ladies often opt for evening or cocktail dresses. Other evenings are ‘informal’, smart attire is desirable. Casual attire is recommended in the day and for evenings spent in port. The currency on board is sterling (£GBP), an account will be opened for you at embarkation and all purchases signed for throughout the cruise. visit www.cruiseandmaritime.com/manage-my-cruise once you have received your travel documents and take a look at the fantastic array of shore excursions that can be purchased on board. You are also able to book these after embarkation but we recommend you take a look in advance to increase availability. With the ability to carry 2,348 guests and a crew of 1,031 NCL’s Norwegian Star is shining brighter than ever after its extensive renovation in 2015. Entertainment is provided day and night as you sail along stunning coastlines in the Mediterranean taking in ports in Italy and Greece. All cabins offer two lower beds (most convert to double) with feather duvet and pillow and all offer bathroom with shower and hairdryer, T.V., safe, small refrigerator, telephone and air conditioning. 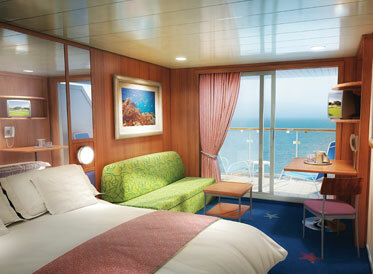 In addition, outside cabins have a porthole or picture window and balcony cabins have a private external balcony with floor-to-ceiling glass doors. There is an electric socket in the cabin of 110v – we recommend you bring a US 2-flat pin adapter. Lounge/Bar: There are 11 bars and lounges to discover, including the Stardust Theatre, The 5 O’Clock Somewhere Bar and O’Sheehans with reinvented Irish pub classics 24 hours a day. Whether you're looking to relax or enjoy a show or make a date with Lady Luck in the casino, there’s a variety of options for your perfect evening. Restaurant: With two main dining rooms, a self-service buffet and a variety of casual cafés and grills included in the price plus the option to sample one of the many speciality restaurants (additional charge applies) – such as the Brazilian steakhouse Moderno Churrascaria and Le Bistro for fine French cuisine – there are 15 dining options to please every palate. NCL are proud of their Freestyle approach to cruising. Aboard their stunning fleet of modern cruise ships, you’re free to plan your days on your own schedule; dine when you choose and dress as you like. The currency on board is US dollars (US$) and an account is opened at embarkation with a credit card for purchases throughout the cruise. You should also carry Euros (€) for any purchases or expenditure at ports of call. Visit www.ncl.com/uk/en/shorex/register once you have received your travel documents and take a look at the fantastic array of shore excursions and speciality dining options that can be purchased on board. You are also able to book these after embarkation but we recommend you take a look in advance to increase availability. The Columbus will become the proud new flagship of the CMV fleet in 2017. She was purpose-built for deep sea ocean cruising and had an extensive refit in 2015 and will be upgraded further before her maiden CMV voyage in April 2017. Offering a feeling of intimacy and personal attention when compared with the ‘mega’ resort style ships built today, she is the perfect choice for those looking for comfort and a wide range of facilities in spacious surroundings with friendly service, stylish entertainment and delicious cuisine. Enjoy the wooden decking and expansive open areas, two heated swimming pools for when the weather is fine, two whirlpools and a large screen for outdoor movies and sporting events while you view the passing scenery. All cabins offer two lower beds (the majority can be converted to double), bathroom with shower, T.V., telephone, fridge, hairdryer, music console, safe, air conditioning and complimentary pool towel. In addition, a cabin designated ‘ocean view’ offers natural light from a porthole or window. There is an electric socket in the cabin of 220v, we recommend you bring a European 2-pin adapter. Lounge/Bar: There is a choice of seven different lounges and bars including the Captain’s Club, Connexions, Raffles and Taverners Pub and Casino plus coffee shops and two deck bars. 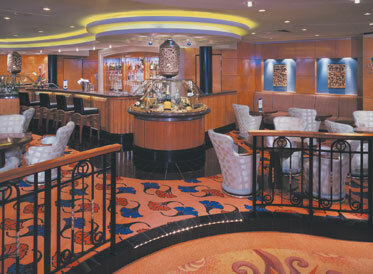 Varied entertainment is offered in the six venues including the three-decked Atrium and tiered Palladium Show Lounge. Restaurant: With five course dinner available at the Waterfront Restaurant, speciality dining at the Fusion, Grill or Chef’s Table restaurants (additional charge applies) or more informal dining at the Plantation Bistro – or even the Alfresco Grill when the weather is fine – there are many dining options on board Columbus. Lounge/Bar: There are 12 bars and lounges to discover, including Champagne Charlie’s Champagne Bar, Maharini’s Lounge and Nightclub or go German and enjoy several premium beers at Bier Garten. Whether you're looking to meet up with friends or make new ones, there’s always an opportunity to mix it up. Restaurant: There are 14 dining options on board to please every palate. With two main dining rooms, a self-service buffet, and a variety of casual cafés and grills included in the price, there’s plenty of culinary delights to try within your package. Plus, there is also the option to sample one of the many speciality restaurants (additional charge apply), such as Cagney’s Steakhouse or the chic Italian eatery, La Trattoria. 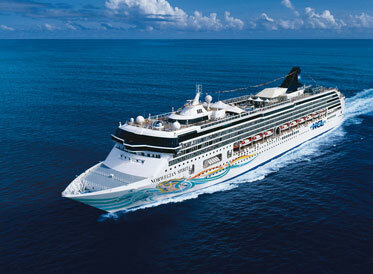 Norwegian Cruise Line are proud of their Freestyle approach to cruising. Aboard their stunning fleet of modern cruise ships, you’re free to plan your days on your own schedule; dine when you choose and dress as you like. visit www.ncl.com/uk/en/shorex/register once you have received your travel documents and take a look at the fantastic array of shore excursions that can be purchased on board. You are also able to book these after embarkation but we recommend you take a look in advance to increase availability. Why not take a look at our full list of our tours to Sea Cruising?